Engraved by C. Huyberts from a specimen by Frederik Ruysch. 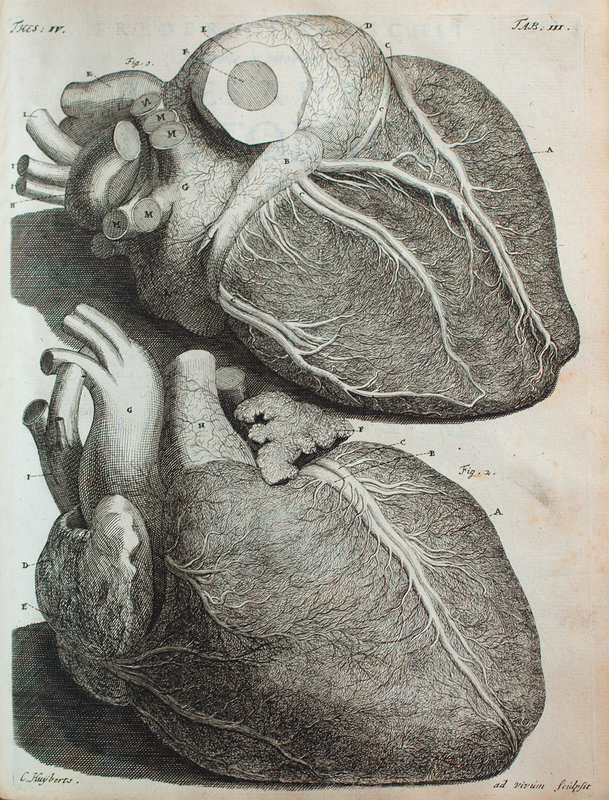 Anatomical diagram of the heart shown in anterior and posterior views. Title derived from caption in text. Thesaurus Anatomicus, a 10-part work first published from 1701 to 1716, is a catalog of Frederik Ruysch's unusual anatomical collection. Illustrated with over 40 plates, engraved by Joseph Mulder and Cornelis Huyberts, Ruysch's collection contains odd assemblages of primarily human anatomical specimens, some of which he composed with the help of his daughter, the painter, Rachel Ruysch. In addition to the curiosities that he contributed to the science of anatomy, Ruysch also advanced techniques in dissection and embalming. Huyberts, Cornelis and Ruysch, Frederik, 1638-1731, “Exhibet cor humanum ceraceâ materiâ rubrâ in totum repletum, ut verus reptatus vasorum, vera cordis, & auricularum figura videri possint,” The College of Physicians of Philadelphia Digital Library, accessed April 24, 2019, https://www.cppdigitallibrary.org/items/show/1517.